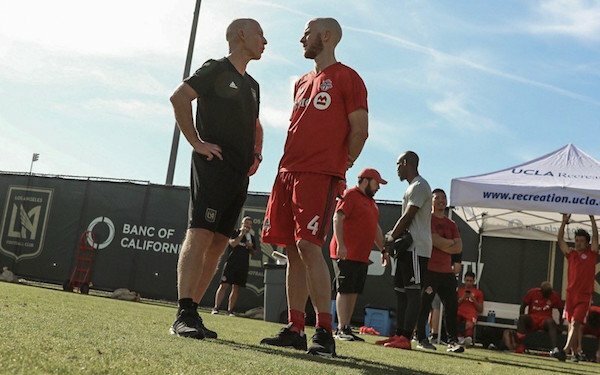 Costa Rican international Marco Urena scored twice to give Los Angeles FC a 2-2 tie with Toronto in the MLS expansion team's first preseason game played at UCLA. Among the free agents who played for LAFC was Maurice Edu, who was on LAFC coach Bob Bradley's 2010 World Cup team. Also in the team that started the game was Shaft Brewer, who played for the Sacramento Republic FC and FC Dallas academy prior to signing with RB Leipzig. He attended the January camp for the U.S. U-20s in Florida. Colorado vs. Sporting KC in Scottsdale, Ariz.
LA Galaxy vs. Real Salt Lake in Tucson, Ariz.
Minnesota United vs. FIU in Melbourne, Fla.
New England vs. Malmo, Sweden in Bradenton, Fla.
NY Red Bulls vs. Philadelphia in Clearwater, Fla.
Portland vs. Seattle in Tucson, Ariz.